King Humbert’s Visit and his Decree to disembowel the region — What has been done — Acres of slums that remain. This photo was not part of the original article. Visitors to Naples during the next few years are advised by the London Globe to “take earnest note of the aspect of the city. In times to come they will have to regard themselves as privileged persons. The city is being reformed out of its old unsanitary ways; it is being leveled to enable it to rise again as fair as modern builders subject to their own contract prices can afford to make it. Scores of the dark, stinking, and slimey alleys, up and down which one has stumbled in terror for one’s pocket amid debris of rotten vegetables, offal, egg shells, fish bones, and the other indescribable foulnesses of the various vicoli and gradelli are being systematically expunged. "Eminently picturesque were these ancient slums in their gloom and parti-colored dirt, and as eminently pestilential. It was here in 1884 that King Cholera reaped a fine harvest among the hapless but light-hearted Neapolitans, who had spent all their days thus in semi-darkness and the shadow of death. When King Humbert, in the course of his brave walks though the plague-stricken city, saw the vile straits to which the people were reduced and the manner of the lives, he passed sentence upon the city. The words have become a local proverb, ‘It must be disemboweled.’ But the work thus designated in a moment was not undertaken off-hand. "It was no trivial business. The years that have since passed have been devoted to the preparation of a large, radical scheme for the welfare of the city, a scheme which financiers, the municipality, architects, builders, and the people to be dispossessed of their hereditary dens have all a profound interest. But not until last years was the seal set formally to this great undertaking for the good of humanity by the same king Humbert who, five years before, had passed among the cholera victims, full of pity for them and abhorrence of their surroundings. On the 15th of June, 1889, Naples held universal holiday, and amid acclamations inaugurated a new order of things. 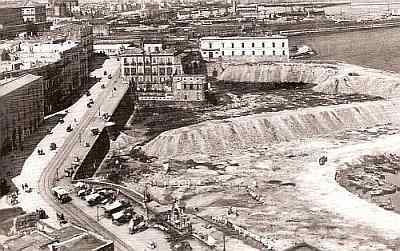 "Doubtless, for many years to come there will be acres of slums in Naples. Those low, cavelike rooms in the back streets one knows so well, with a Madonna on the wall dimly seen in the background, a big bed set on the grimy boards underneath the Madonna, with womenfolk and children here and there about the room working or chattering, while the master of the habitation—a half-asphyxiated cobbler or a sallow thin-cheeked brassworker—sitting in the doorway, makes shoes or pots and pans for a livelihood; these familiar scenes will long continue to exist in Naples. But year after year they will have to be sought with a little more effort. At present they abound. As soon as the stranger wanders from those principle thoroughfares—the via Roma or theStrada del Duomo—he is likely to find himself involved in a network of threadlike lanes, with lesser capillaries on either side, leading by pocket squares and spaces, penned in with tall black houses to the filthiest of culs-de-sac. Here he will have a surfeit of such pictures. Our London rookeries are bad enough in all conscience, but it would be hard, even in the vicinity of Ratcliffe highway, to find inhabited warrens so mean and depressing as these in the heart of the city which all the word agrees to regard as one of the fairest of the fair. The scene painters for the Surrey Theatre, nourished on melodrama, should journey to Naples while yet it may profit them. They will find no such ideal residences elsewhere for the conventional stage villains of low life. “We of the north are not prone to take very seriously plans for national and civic amelioration of which echoes reach our ears from the south. Italy has so long been a hotbed of abuses, a very type of monstrous decadence, the stock equivalent for poverty. But, of course, we argue here upon preconceived notions and prejudices. Realities give the lie to fancies in a most emphatic way. For all our brags of superiority in the arts, inventive and mechanical, we in England can show few buildings to compare with those of modern improvement in Milan and Turin and those designed for Naples. This rage for thoroughness may for a time prove gravely embarrassing to the capitalists of the Peninsula and affect the credit of the nation itself. But the nation has little doubt the end will justify the means it has used (perhaps a thought extravagantly) [sic] for its aggrandizement. The Neapolitans are not a little proud that the model houses (case economiche) will benefit Naples more than the model houses that have resulted from the movements of Lord Shattesbury and Lord Cross have benefited London. The latter are supposed to accommodate 146,809 persons, whereas new Naples offer accommodation to 60,000 poor, over and above the multitude of existing residents who will be dispossessed for the moment only to be transferred to the more commodious and wholesome new buildings. “It is the most ancient part of Naples that is being ‘disemboweled.’ The risanamento scheme proposes to do for the west of the city what the Viceroys under Spain did for the east of it. The nucleus of the city, built over the Parthenope of the times of Greece and Rome, will be left for the present but little touched. This is really the very worst part of Naples, but it must be approached gradually. The fringe of hovels and insalubrious houses which the Angevine and Aragonese epochs of Neapolitan history have tacked onto this nucleus is first of all to be mercilessly pruned away. This, too, can only be done by degrees, for the scheme is gigantic. A broad highway is being driven through the midst of this unsavory neighborhood. This will be of the most modern kind. Tall houses with balconies, stucco and stone work, lofty rooms, and careful sanitary arrangements will make the incongruity between it composition and its surroundings insufferable for long. And from this highway new byways will year by year radiate further and further into the diseased centre. The lean and harassed horses and bullocks, who are lashed and goaded to transport their burdens of rubbish from this now desperate and collapsing quarter, will not have suffered in vain if Neapolitan energy and finance hold out to the end. “Overcrowding is in Naples, as elsewhere, the source of a vast deal of disease and immorality. There is no other such packed city in the western world. Many causes hurried immigrants bitter centuries ago—the break-up of the feudal life, whereby the barons of the Apennines and Calabria left their castles for town houses, the privileges accorded by the Aragonese sovereigns to the Neapolitans at the expense of the other residents in the realm, the oppression of feudal lords and their stewards, the greater insecurity of life and property elsewhere, especially on the coast, then subject to constant raids from Algeria and Turkish rovers; the attraction of a rich court, and the ordinary temptations of trade to vagabondizing artisans and merchants from Florence, Genoa, and the low countries. Thus was that unique people, the Neapolitan, compounded. Here is a Venetian’s description of them in 1634: ‘I go through the city, and in addition to the countless number of artisans at their work, and the people engaged in their houses, I see in every street, in every byway and alley, such a crowd of people who push me and tread on my toes, that I can hardly make my way through the midst of them. I go into the church where they are preaching (and they are numerous), and find them choke full of people. I go to the courts of justice, and it is a marvel to see the assembly, even as the streets, (not one nor ten only, but all,) are full of people, on foot, on horseback, in carriages, with a murmur everywhere like the buzzing bees, so that nothing is more difficult for me than to get about Naples, go where I will, and at whatever hour of the day.’ Those who know Naples may be excused at feeling surprise at the fidelity of this portraiture 250 years ago. So far as its tone and manner of life are concerned, there is not a hair’s breadth of dissimilarity between the Naples of 1634 and the Naples of 1890. The streets are more crowded than in Carpaccio’s time, and one has to look out for one’s toes more sharply than he. This is the chief difference. “A few figures will show the extent of the actual scheme of amelioration. It affects an area of 980,686 square, meters. At present this includes streetway of 218,702 square meters, but under the new scheme streets will occupy no less than 604,990 square meters of the whole area. Breathing and moving space will thus be increased from a percentage of 22.31 to 61.69—a very considerable change, indeed. The density of the population will of necessity be diminished in proportion. Instead of, as at present, being 1,610 per 10,000 square meters, it will be 700. To show, further, how sweeping a measure the scheme is, it may be said that it affects 271 streets, of which 144 will be wholly abolished and 127 broadened. Of 56 warehouses and 527 detached houses which stand in its way, it altogether expunges 391, and interferes with the other 136. It destroys 17,000 dwelling houses and 62 churches. It dispossesses no fewer than 7,100 landlords, 5,400 altogether, and 1,700 partially, and turns 87,447 people out of their homes—69,198 altogether, and 18,249 temporarily. Of these last, those definitively dishoused include 4,693 persons of easy circumstances, 25,151 people moderately well off, and 39,354 poor. “For a time the city will be in a somewhat chaotic condition, and there can hardy fail to be a good deal of friction as well as of dust and discomfort. The man who has grown up in the midst of dirt and filth and gloom may be pardoned for at first doubting the pleasantness of the change in store for him. Though it was ever so nasty, the particular vicolo of his nativity has endeared itself to him as his home. The model houses, four or five stories high, with windows looking down upon wide streets with young trees set by the footpath, dazzlingly luminous, and so airy that he may fancy himself in peril of death from cold, will not catch his fancy all at once. But patience will work wonders even with the lazzarone benefited against his desire. And when a few weeks or months have passed, even the most prejudiced and debased of Neapolitans will be forced to acknowledge that he has little to grumble at if he gets a clean and lofty room for a sum equivalent to 6s. a month, with the use of the pure water of the Serino into the bargain, as a substitute for his old quarters. The workingman with a family may live here in ease with a suite of five rooms and a kitchen for about 25s. a month.